Tj Nguyen in the SCORE lab. He is seated beside a 3D printer, which is printing gears to enhance its own functionality. Tj Nguyen has an undergraduate engineering degree from Auburn, and is working toward his Master’s while he serves as Assistant Director of the Southeastern Center of Robotics Education (SCORE). He is also a recent graduate of the College of Education with a powerful ambition: to increase the ability of Alabama school children in Science, Technology, Engineering, and Mathematics (STEM) and dramatically improve their achievement scores. The Southeastern Center of Robotics Education, or SCORE, is a new and innovative Auburn University outreach initiative designed to more effectively develop and deliver robotics education to K-12 students and teachers. The SCORE program centralizes the robotics education activities already underway in Auburn’s College of Sciences and Mathematics, College of Engineering, and Auburn University Aviation Center It provides a mechanism for growth in the area of robotics education outreach. The SCORE initiative is the only center of its kind in the country. 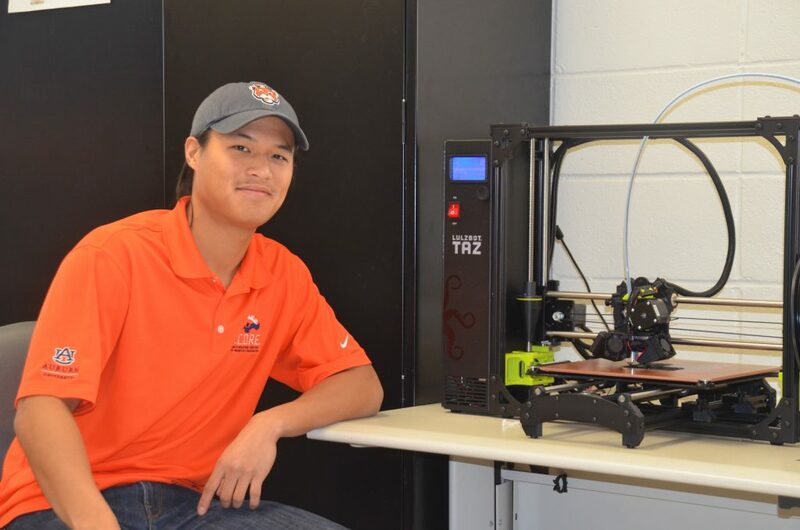 Nguyen became interested in Auburn through its BEST Robotics competition when he participated as a student at Hoover High School. As an undergrad at Auburn, he worked for Mary Lou Ewald, Director of Outreach for the Auburn University College of Sciences and Mathematics. Ewald gradually increased his job duties to the point that when he graduated, she hired him on as the center’s assistant director. Nguyen and Schnittka continued their collaboration and developed a paper on using competitions in robotics curricula to increase motivation and self-efficacy. Along the way, Schnittka inspired Nguyen to channel his energy and talent for robotics and the STEM disciplines for maximum impact by enrolling in the College of Education. He earned the Alternative Master’s in General Secondary Science. Like many scientists and engineers, Nguyen assumed that since he knew the content, he could teach it. He learned differently through his classes in the College of Education, and now feels ready to lead as someone who understands STEM, the place of robotics in these disciplines, as well as the pedagogical methods for effectively conveying those principles.